Digital Learning Day was February 6. How did your school raise awareness for digital learning? Worcester Academy’s library chose to showcase QR codes. We commissioned a display project from art students. We were thrilled to discover the QR code they created actually scans! Library staff researched media such as e-books, podcasts, videos, and websites that connected to library books and other materials. 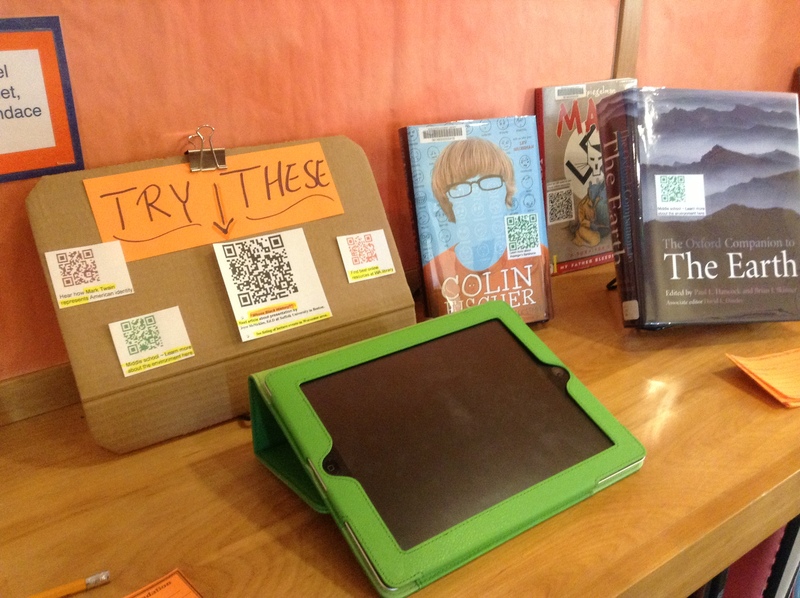 Then we created QR codes and affixed them to the books and materials. in the picture above, you can see Neil Gaiman’s novel Anansi Boys. The QR code attached is linked to a YouTube video cartoon version of one of the many Anansi folktales. The other book, 1812: The War that Forged a Nation by Walter Borneman is linked to an episode of the In Our Time Podcast that discussed that war. The display was wide-ranging and included links to library resources, Black History Month resources, and resources related to the curriculum. 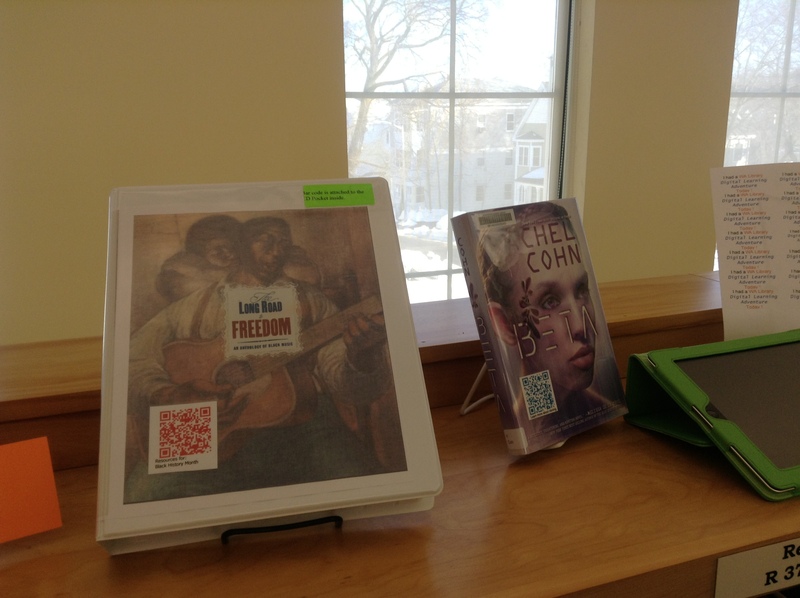 Books connected to a major World Civilizations project that ninth graders complete at Worcester Academy had QR codes that linked to e-book versions that students could access from home. Fiction and other media were not slighted, either. A new box set, The Long Road to Freedom: An Anthology of Black Music has a QR code that links to Black History Month resources, and Rachel Cohn’s novel Beta links to the Human Genome Project’s Cloning Fact Sheet. 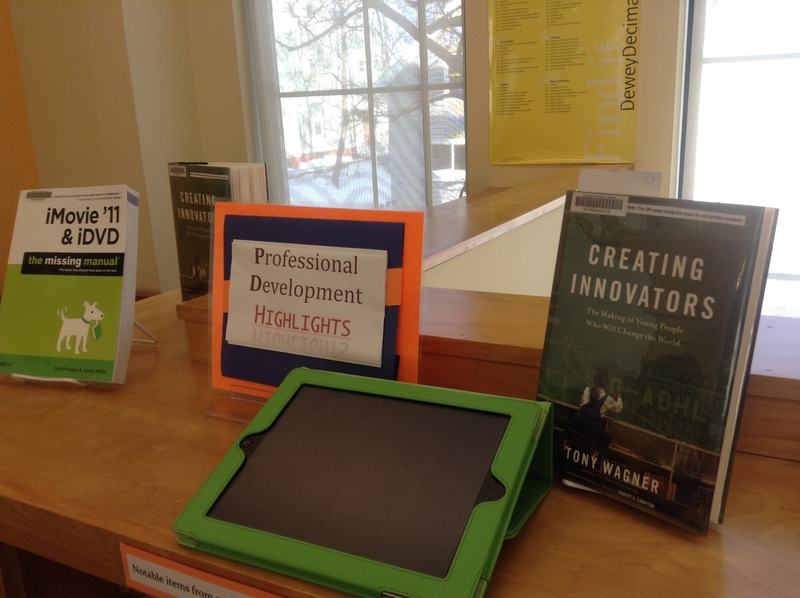 We also displayed some titles from our Professional Development Collection. You may have noticed the iPads as well. 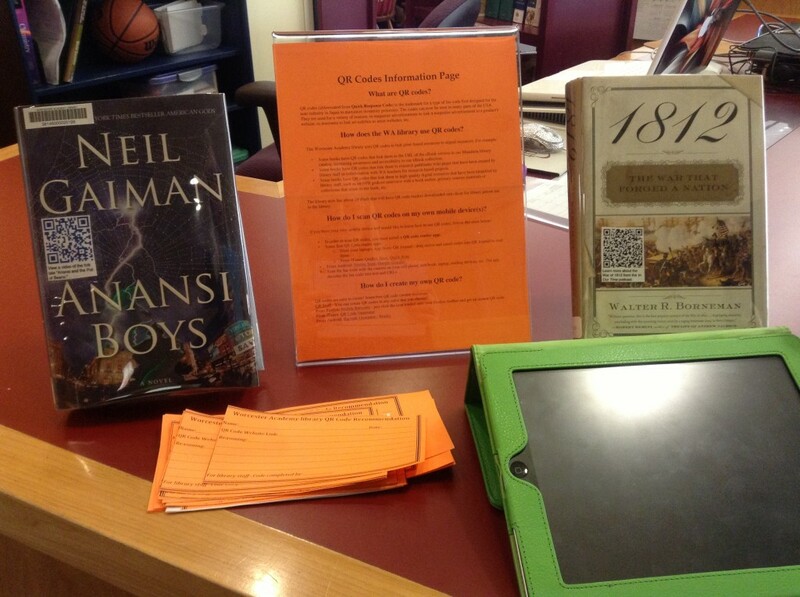 The library owns a set of iPad 2’s and 3’s loaded with a QR code reader called Qrafter. 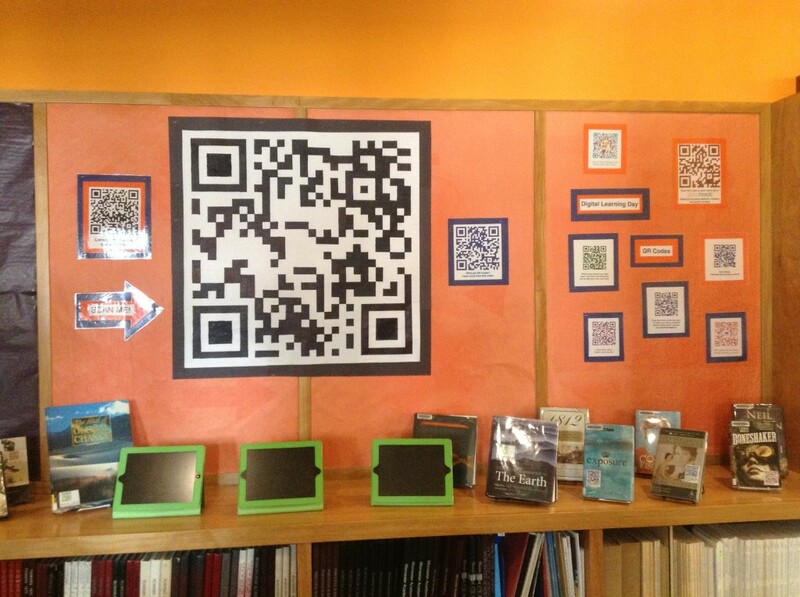 Students and teachers can scan the QR codes using their own devices, or they can use one of the iPads and send the link to themselves from the iPad. 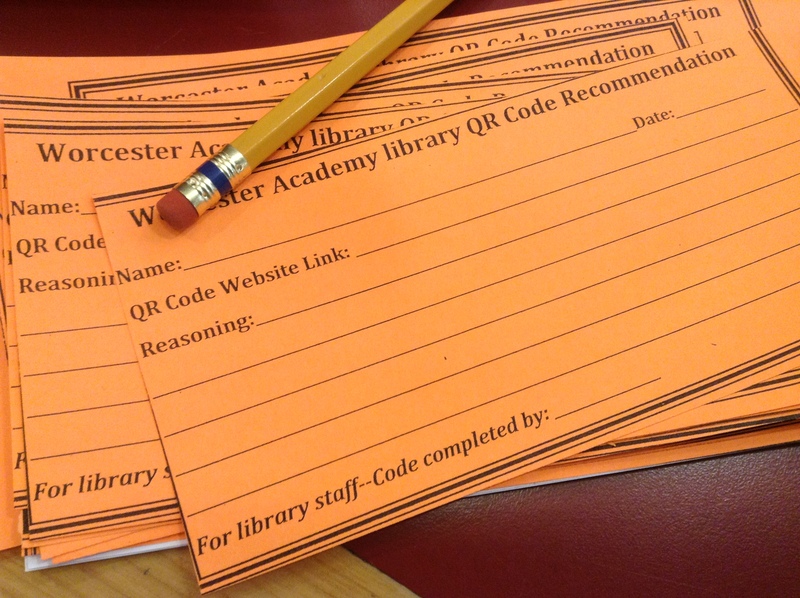 We set these slips of paper out among the displays for students and faculty to suggest QR codes for books and other media. Two of our sixth graders have already shared QR codes. One student shared a book review of the children’s novel Tuck Everlasting and another student shared a Britannica blog post connecting gladiators in ancient Rome toThe Hunger Games. 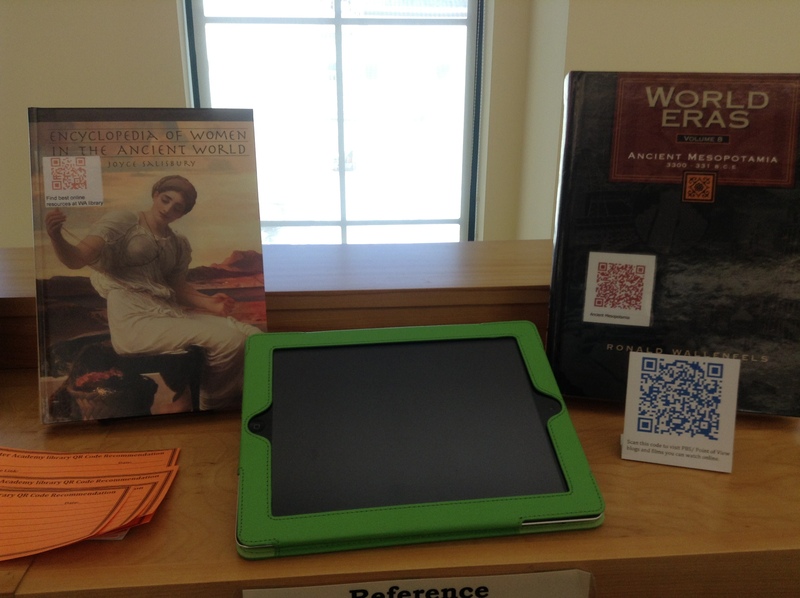 QR codes have enormous potential to extend learning in libraries and information services far beyond the four walls of the libraries themselves. 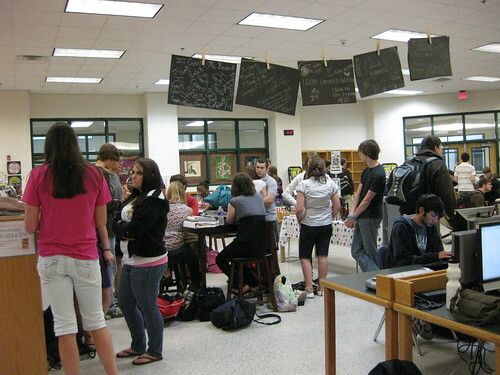 The Unquiet Library, run by media specialist Buffy Hamilton at Creekview High School in Canton, GA., has a wonderful writeup in American Libraries. The students are skeptical when the librarian says, “I want everyone to take out their cell phones and check to see if you can get reception in the library.” The young scholars hesitantly pull out their mobile devices unsure of what to make of this request. “Your assignment is to charge up your phones for class on Friday.” This wasn’t like any librarian they had met before. Here’s how much of a library nerd I am: I teared up as I read the last paragraph. Good for you, Buffy! And for Creekview and its students and teachers.